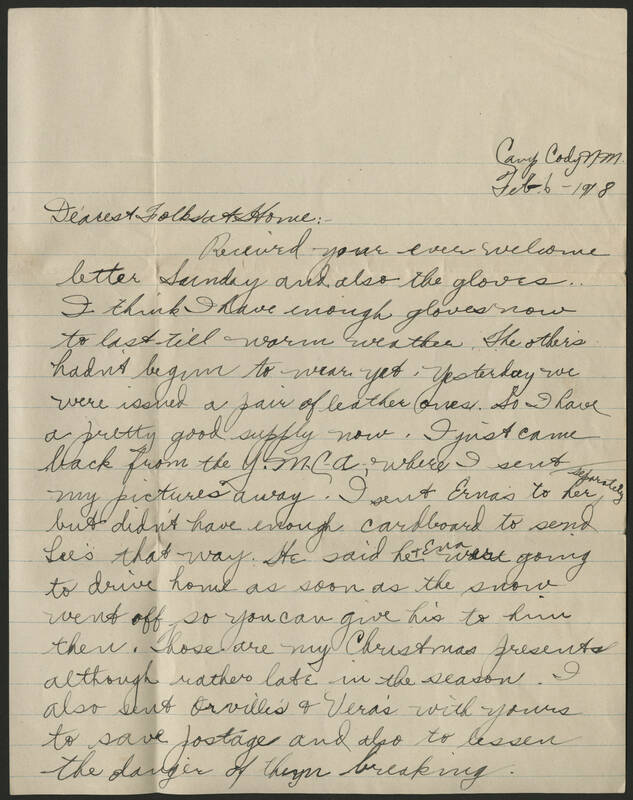 Camp Cody NM Feb 6 - 1918 Dearest Folks at Home: Received your ever welcome letter Sunday and also the gloves. I think I have enough gloves now to last till warm weather. The others hadn't begun to wear yet. Yesterday we were issued a pair of leather ones. So I have a pretty good supply now. I just came back from the Y.M.C.A., where I sent my pictures away. I sent Erna's to her separately but didn't have enough cardboard to send Lee's that way. He said he & Ena were going to drive home as soon as the snow went off so you can give his to him then. Those are my Christmas presents although rather late in the season. I also sent Orville's & Vera's with yours to save postage and also to lessen the danger of them breaking.